Star-studded event honors the very best in local Long Island media and reporting over the course of the previous year. 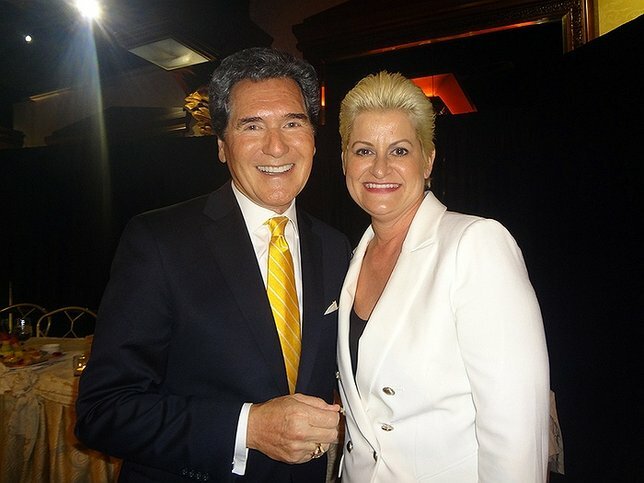 (Lto R): Folio Lifetime Achievement Awards winner Ernie Anastos, Fair Media Council CEO and Executive Director Jaci Clement. Woodbury, NY - April 22, 2016 - On April 22, the Crest Hollow Country Club of Woodbury was host to hundreds of attendees at a gala occasion- the 2016 Folio Awards, a lavish annual luncheon whose purpose is to salute the very best in local Long Island media and reporting. Held by the Fair Media Council (FMC), one of the oldest and most successful media watchdog organizations in the country, the Folio Awards pay homage to a number of Long Island-based groups and individuals who exemplify what hyper-local reporting means to the communities that they serve. In addition, the event was highlighted by the awarding of FMC’s Lifetime Achievement Award to a true legend in the industry–Ernie Anastos, the Emmy-award winning news anchor for Fox 5 News. At a speech given at the event, Fair Media Council CEO and Executive Director Jaci Clement noted that the day’s winners were responsible for tapping into the pulse of what Long Islanders want to see, hear and read in their news. Winners at the Folio Awards included NBC New York’s I-Team for coverage of issues within the Nassau County penal system, a New York CBS 2 report on alleged administrative and financial issues at Hempstead High School, and LongIsland.com for their extensive coverage of 2015’s Winter Storm Juno. Award presenters included PIX11’s Brenda Blackmon, FOX 5’s Greg Kelly & Rosanna Scotto, WCBS/WPIX’s Craig Allen, NBC New York’s Michael Gargiulo, and many others. Clement touched on the current state of Long Island journalism; she highlighted its many strengths, but also noted that it requires expansion and more community engagement, and took the time to point out several established and up-and-coming news outlets that are covering local events, politics, crime, and more in an aggressive and informative manner. Clement lavished praise upon Lifetime Achievement Award winner Ernie Anastos, calling him someone that has been the very face of the ever-changing New York news landscape since he first picked up a microphone back in the 1970’s, and has continued to bring families the best in hard-hitting and ethical journalism to this very day. After receiving heartwarming tributes in the form of a picture montage set to music covering of his years of reporting and a touching and humorous introduction by his boss at Fox 5, Byron Harmon, Anastos thanked those in attendance, encouraging them to always be positive, and to never, ever give up on their dreams. Subject: LongIsland.com - Your Name sent you Article details of "2016 Fair Media Council Folio Awards Salute Local Media, Homegrown Reporting"